So when I joined a friend for a picnic at Dupont Circle today, with gorgeous weather, neither of us had realized it was the day of the Capital Pride Parade! 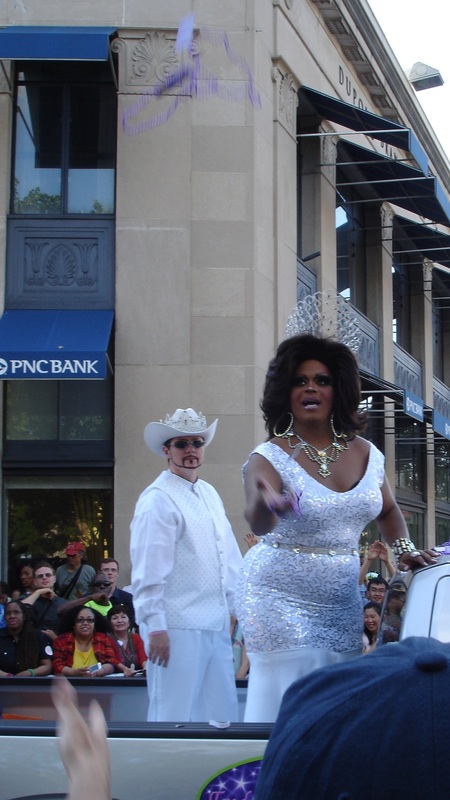 We both knew it was gay pride week, but we hadn’t paired that with Dupont Circle (epicenter of all that is gay in DC). So our picnic became parade watching. And this became my new thing for this week, something that I had never attended in my 20 years here. Though I have a number of gay friends, I’m not, and I’m afraid the parade has never been on my radar. (I’m sure some of you are thinking of gaydar here, ha, ha.). The sense of pride, by both the marchers and the community, was strong. As were the colors. Midway through we went to go get milkshakes, and we didn’t stay til the end (I stayed a little later than David to get some more photos) but all-in-all, I was glad to be part of it. Proud that our country is changing enough to begin accepting this community for who they are. And inspired to dye my hair blue more often (which would make twice). Very colorful. Did you catch any beads or get any memorabilia? I wound up with a small British flag (a contingent of Brits were marching – saying LGBTs were welcome in Britain, and they were wearing shirts saying that marriage was legal there), and a couple handfuls of candy. I deliberately avoided the beads, as I have so many already.